Ethicon Vaginal mesh lawsuit ends in plaintiff’s verdict. The jury in a Philadelphia state court jury found for a plaintiff and awarded a $20 million verdict against Johnson & Johnson’s Ethicon division, over complications with the Ethicon TVT-Secur transvaginal mesh. Ethicon Vaginal mesh and bladder sling for repair of pelvic organ prolapse and urinary incontinence may lead to pain, further surgery, recurrence of symptoms and erosion of the devices through soft tissue. 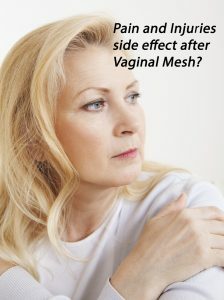 Vaginal mesh side effects continue to plague the blockbuster plastic medical devices with severe and catastrophic complications. Vaginal mesh and bladder sling for repair of pelvic organ prolapse and urinary incontinence may lead to pain, further surgery, recurrence of symptoms and erosion of the devices through soft tissue. But just don’t take my word for it, according to court documents, Vaginal Mesh Injury lawsuit claims continue to be filed nationwide and have been so for the past 7 years.